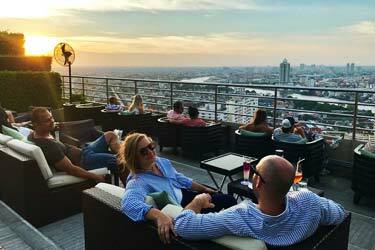 A complete guide to the 3 best rooftop bars in Hamburg in 2019. Here you'll find the best Hamburg rooftop bars, complete with info about each terrace. Opening hours, dress code, photos, maps and much more. Hamburg is a cool and international city in Germany. 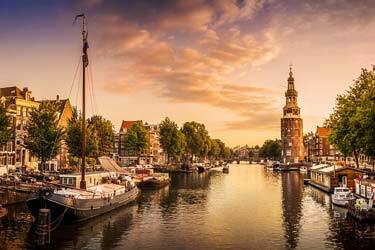 The big harbor and proximity to several big cities in Europe makes it very popular. During summer the rooftops here are usually packed with party people from all over the globe. Which are the best rooftops in Hamburg? 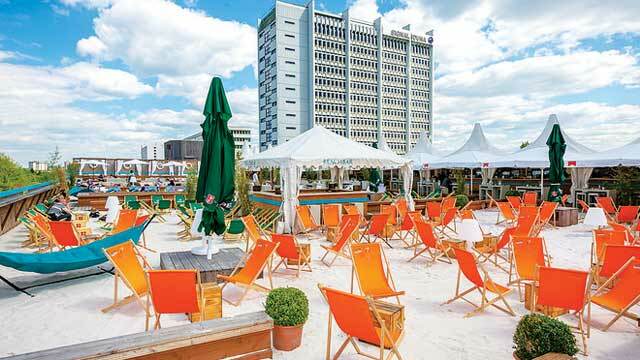 Find the Hamburg rooftop bar best suited for you. Or use the Hamburg rooftop map in the bottom right corner. A stunning and sophisticated rooftop bar in Hamburg that offers a bit of everything, but foremost an outstanding 360-degree view of Hamburg and its surroundings. Open daily foom noon, the terrace has it's own bar and is stylish decorated with standing cocktail tables, lounge sofas and some very comfy daybeds. The rooftop bar serves an extensive selection of champagnes and wines, crafted cocktails and also small meals and snacks from the kitchen one floor below. Soft lounge atmosphere during daytime/early evening and laid-back rooftop party later at night. A soft and stylish cocktail lounge and rooftop bar offering a superb panoramic view of Hamburg and it's skyline, and more so, a lovely view of the sailboats passing by on Lake Alster. If you pinpoint a sunset here, you are sure to be in for a real treat. Only open when the weather is fine, the terrace has a classic lounge setting with lots of comfy sofas and a Campari-isnpired bar. Choose between champagne, wine or a good selection of speciality cocktails. The perfect Hamburg rooftop bar to just sit back and relax with a loved one or some friends, watch the sun set over Lake Alster and chat the night away. A rooftop beach club located on top of the Hamburger Meile shopping centre, not on the beach, but right in the middle of Hamburg. Furnished with lovely lounge furniture, sunbeds, beach chairs, and with a floor of Fiji-sand and a small rooftop pool, this really is an urban oasis in the buzzing city center. Here you find three cocktail bars serving bubbles, ice cold beers and a large array of colorful and tasty cocktails along with an integrated restaurant serving a wide range of food. 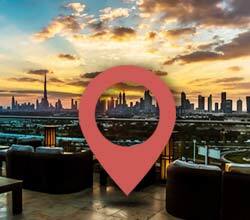 Perfect place for sunny afternoon cocktails with your feet in the pool, as well as amazing and vibrant sunset sessions. Discover the biggest collection of Hamburg activities, guided tours and skip-the-line tickets. Anything you want you'll find right here. The climate in Hamburg means cold winters and hot summers. So if you want to get the most out of your visit one of the rooftop bars in Hamburg, then you should go here sometime between April and September. 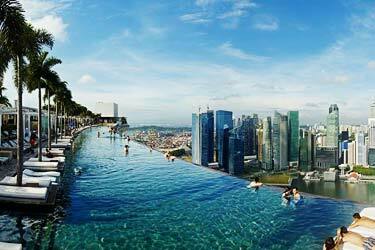 During this time the roof terraces are very lively and also most beautiful to visit. 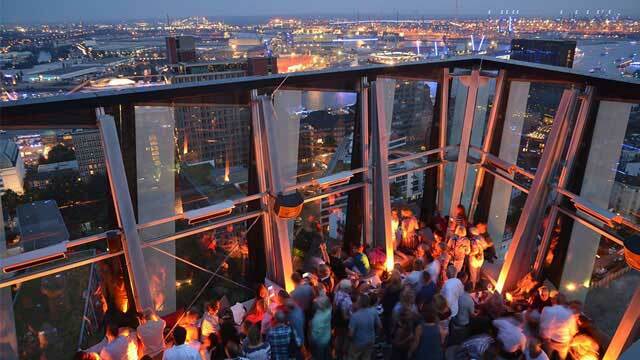 The best time to visit a sky lounge in Hamburg is in the summer. 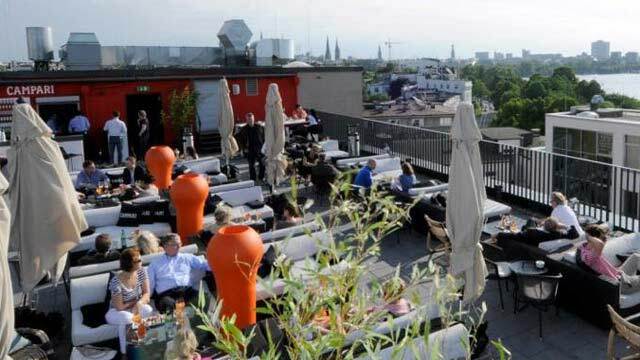 The views are fantastic and the atmosphere pleasent, which both are typical criterias for a sky bar Hamburg. 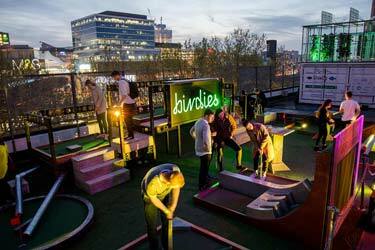 So, which is the best rooftop bar in Hamburg? This list will help you find the answer of that question. Hamburg is Germany's second largest city and also one of the country's main cities, thanks to one of Europe's largest container ports. 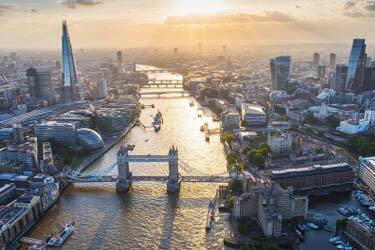 It also has one of the highest GDP per capita. 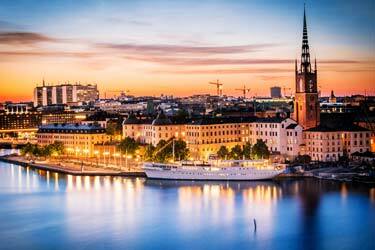 The city is situated very beautifuly on the mouth of rivers Alster and Bille. 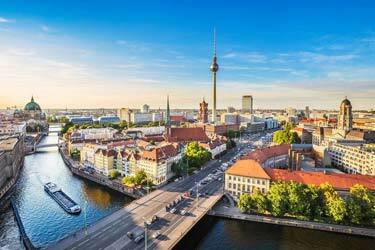 Hamburg is, like many other port cities, famous for its lively nightlife. Most clubs and bars you find on the Reeperbahn. Unexpectedly so, Hamburg has a lot of nice beaches. Blankenese beach in the exclusive district of Blankenese and Elbstrand that is closer to the city center.